Phones4u has scored a cheeky exclusive in the form of the white LG Optimus 3D. No release date is specified, but customers eager for 3D beaver can currently pre-register their interest. 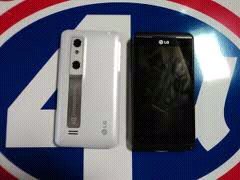 “The LG Optimus 3D White will be available to buy in the near future,” promises Phones4u. Thank goodness; if there’s one thing I crave for my phone-based pictures, videos and games, it’s a third dimension. 2D is so 20th century. The LG Optimus 3D uses autostereoscopic - or "glasses-free" - technology, like the Nintendo 3DS. It has a 4.3in screen, dual-core 1GHz processor, and uses twin cameras on the back to capture pics and video in 3D. The world’s first 3D smartphone also has HDMI out capabilities, so you can connect to your TV. It’ll ship with Android 2.2. (Froyo), but an upgrade to Android 2.3 (Gingerbread) is expected shortly after launch. Whenever that may be.